The American Heart Association Heartsaver CPR AED skills session is the hands-on portion of an AHA eLearning course and includes skills practice and skills testing. It is conducted in-person after a student completes Heartsaver CPR AED Online course (sold separately). The CPR AED online course is approximately 1 hour in length. Click here to purchase and complete the Heartsaver CPR AED Online course on the AHA website. Participants must complete the Online course, print out the certificate and bring it to the skills session class. 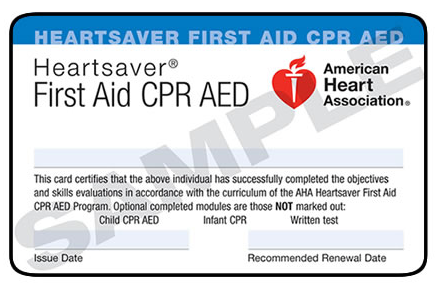 Upon successful completion of the skills session, you will receive the AHA Heartsaver CPR AED Certification Card.